Our intuition may wish to direct us into patterns of activity, or destinations, that are outside our "comfort zone", but it will be blocked if these pathways have been shut down e.g. by traumatic experiences, unhealed wounds, repressive training, poor role models or excessive discipline during childhood. The "Five Rhythms" are a range of inherent patterns of motion that are the (sometimes latent) potential of all human beings. If one or two of these natural human patterns are "dead", blocked or inhibited we are to some extent unbalanced in our lifestyle and will find it more difficult to live and enjoy life to the full, with a steady flow of energy. Blocked energy is inaccessible energy. Controlling or repressing fundamental aspects of our nature uses up energy as well as cutting off access to the energy of the repressed behaviour. "The Sense of Being Stared At and other aspects of the extended mind"
"Dogs That Know When Their Owners Are Coming Home and Other Unexplained Powers of Animals"
"Whole Heartedness - Healing Our Heartbreaks" by Chuck Spezzano. 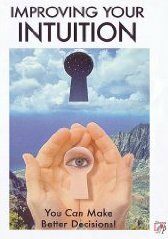 Our sixth sense of intuition is very useful in self-healing of our hang-ups, neuroses and "hot buttons". We can ask our intuition key questions that will ascertain when, where and how our painful unhealed emotional or spiritual wound was created (Review & Ordering information). Intuition - Trust your vibes!